The good news is that card counting works. For nearly a decade, I have provided for my family through beating casinos at a card game. I put my wife through school, we bought a half-million dollar house, rental property, and I haven’t had a job ever since I became a professional blackjack player at 23.The bad news is that it’s not a “get rich quick” opportunity. And anyone hoping for a get rich quick scheme is thinking like a gambler. You see, gamblers are looking to defy the odds. They want an easy out, a get rich quick scheme, and will often bankrupt themselves in that pursuit. It’s why people play the lottery. Did you know that your mathematical expected return (what we call “Expected Value”, or EV) of a $1 lottery ticket is 8 cents? But whenever the lottery gets large enough, people get eyes as big as saucers and start gambling at the lottery. The first step to thinking like a card counter is to stop thinking like a gambler and to start thinking like an investor. Yeah, it does. I’ve made over $300/hr as a card counter, and some of the Blackjack Apprenticeship Pros have made even more than me! But the first step to thinking like a card counter is to stop thinking like a gambler and to start thinking like an investor. That’s why I’ve never played the lottery. It’s a losing bet. And I’m interested in smart money decisions based on positive Expected Value. When I got into card counting, I believed a lot of the common misconceptions about it. But as I continued to study, I realized it was a smart investment based on math and hard work that I could do! So I didn’t even enter a casino until I had spent nearly a hundred hours practicing counting cards and memorizing tables. I went into casinos with a calculated bankroll, calculated advantage, and a laser sharp focus on beating the house. Our culture has become obsessed with the get-rich-quick mentality, and have met hundreds of people (inside casinos and out) who are looking for that angle to become a millionaire without using their brain or hard work. Gambling perfectly plays into this mentality; gamblers know the odds are literally stacked against them, but they still think they will be the one to beat the odds. In both gambling and life, the odds will catch up with you over time. And the longer you try to defy the odds, the sooner you can wave goodbye to your hard earned money. What does this mean for you? Smart investing at the blackjack tables, or as we call it, advantage play, isn’t limited to the game of blackjack, or even casinos. It’s a philosophy. Advantage players (aka card counters) look for maximum Expected Value at the gas pump, the fast food restaurant, everywhere we go. Our goal at Blackjack Apprenticeship isn’t to just teach people to beat a card game, but to teach people to think like an investor. So don’t get caught up in large numbers of what could happen, but start thinking through the value of decisions and base your decisions off the expected value. If you came to our website in an effort to turn $10 into $1,000,000 without much effort, LEAVE! Better yet, stop wasting your energy on a shortcut and start working smarter. If you think card counting is your solution to being lazy and financially irresponsible, you’re wrong. If you’re lazy and irresponsible with money, you’ll lose it at the tables. Successful people don’t get lucky. They make their own luck. 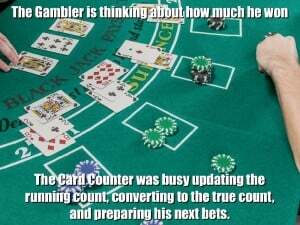 Card counting works. But it only works for people looking to work smarter, for people who are willing to put in the time and energy to do something exceptionally, and you have the patience to invest your time and money at the tables. Until next time, keep generating EV!